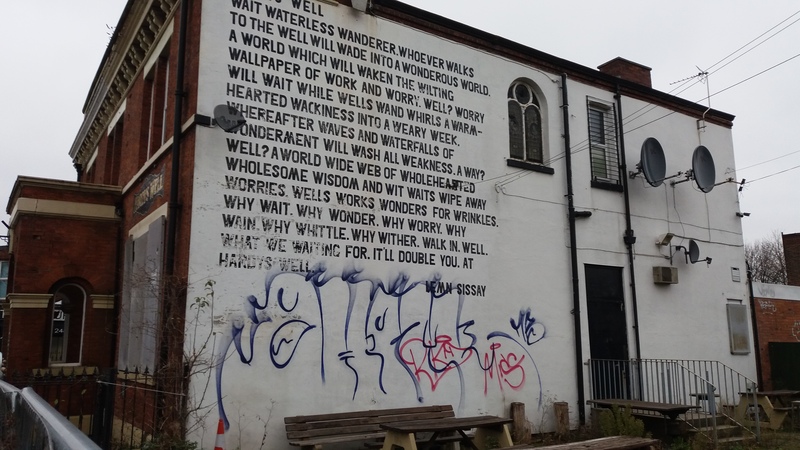 I am in Washington DC and I’ve just heard the distressing news that Hardys Well in Manchester is to be demolished along with the much loved eponymous poem. It is the first public art poem in what has become a movement in contemporary poetry in England. Manchester was the first.The poem was erected in 1994. To find the last movement of this kind look to the concrete poets of 1950’s and 60’s and particularly Ian Hamilton Finlay of Scotland. But Landmark poetry has never been as popular as it is today. It does not have to be the end of this poem. Is there a building on Oxford road or Wilmslow Road that could be adorned with a Landmark Poem before this one disappears? The building may be condemned but the poem is not! This poem connected me on the way into work for years. I looked out for it every day. Am absolutely gutted that it’s going. Feel like it’s something else in the changing face of Manchester that is taking away our uniqueness and replacing with a bland corporate sellability. Am a progressive and love to see the city remaining contemporary but this, this is an outrage. Dear Lemn, so much of our city is being demolished with no thought to the people who actually LIVE here. Your poem on that wall is something I pass quite often. But it is not even about that. It is about corporate demolishing of Manchester’s very valuable history. And it seems to be going on a pace. I am in touch with Manchester Shield and do hope the voice of the people can make a difference. Julia (Farrand). Driving past Hardys Wells on a breezy, hazy Summers day, smiling up at a poem that has been part of my own personal geography, I’m happy. To think that it is to be demolished, I’m sad! Who is making such an unconsidered decision? This poem is an important part of Manchester culture, don’t destroy it, let it remain to be part of other people’s smiles, hopes and memories. Lemn, Lesley, Carmen – the Rusholme & Fallowfield Civic Society applied successfully last year to have Hardys Well listed as an Asset of Community Value, so we will follow up on the news that it is to be demolished. Meantime, can you, or anyone, think of a viable use for this historic building? Or be prepared to contribute ideas? Hi Sue, I thought that the building was listed in some form as there is some tiling along the top referring to the Hardy’s brewery. Though I cannot be sure it may be worth checking. Hi Joe – sadly the building is not listed in this sense: https://historicengland.org.uk/listing/. The civic society managed to get it listed as an Asset of Community Value in this sense: http://www.manchester.gov.uk/info/200101/voluntary_organisations/6271/community_right_to_bid. Hey I think that Hardys Well should remain as a public house – I can see the trend of the old boozer is dying out – a real shame for working class history where the common man (and woman) would meet up, sing, drink, celebrate the good and the bad together. Going down the boozer was where community happened – but times have changed, some religions don’t use alcohol to mark life’s occasions and the trendy cafe bar and lattes have replaced the spit and sawdust. How about keeping a pub as part of our history – maybe introduce the idea that pubs where a lot of thinking and debates take place. I’m sure the cooperative movement, the communist manifesto, sufferage movement, abolition of slavery and free trade all benefited from some thinking and drinking in Manchester – maybe even Hardy’s Well. Dear Elaine, yes times change. But I do worry about the wholesale destruction of so many pubs and other buildings. It is something we can never get back again. Our architectural history. I also remember the ‘old days’ of the pub. When people met up for a drink. And didn’t get blitzed. My next door neighbours dad used to work in the entertainment business. And close to closing time we would sometimes have a sing song. I don’t want to sound like some old git who is harking back. To a bye gone age. But maybe, actually, I am? It was the 1980s and the day of the pub. People got together to have a few bevvies. And no one got out of order. It was just nice, you know? I was in Manchester for the Roses gig in June. I AirBNB’d just down the road, and stumbled across Hardy’s Well…and the poem…by chance. I took several photographs of the poem. At the time I thought it was sad that such a proper old-school boozer with plenty of character had closed, like so many others. I am now truly saddened to discover that the building – and the poem – are condemned and will soon only exist in photographs and memories. Such landmarks give urban spaces histories and biographies. To lose such landmarks is to lose part of a city’s soul. I remember when the poem was painted on the wall of Hardys Well. It’s part of my personal Manchester landscape and it makes me feel at home whenever I visit. It is enormously sad that it is to be demolished. I hope that the decision can be reversed. Was it 1992 or 1994 Liz? I’m very sorry to hear about this Lemn. I’ve contacted Nicky Wake as I help manage a building very nearby which could easily host a similar scale work, and we’d be delighted to do so! Absolutely gutted, would look out for this poem every night on my way home for work for six whole years. So sad to see yet another part of the quirkiness that is Manchester disappearing from our landscape. Can it not be saved by a local museum or art gallery? Lemn, we are both linked by this famous landmark. When working for Bass, I named the pub Hardy’s Well and decided I wanted a complete break from the violence and trouble in the old Birch Villa. The renaming and internal redecoration changed it slightly but your poem erected by Andy Pye the manager was a total inspiration to a new pub and a reviving Manchester. This poem represents something more fundamental and is a reminder of change – to me it’s the equivalent of book burning! If there is anything I can do to help preserve this poem please let me know. Joe That is really kind and a great point of record It’s a pleasure to meet you. Am I right in thinking it was 1994 when the poem went up. Or was it 1992? Hi Lemn, you’re more than welcome and it is an honour to be even tenuously associated with you and your work. I think it was spring of 1995 when the poem went up. Always enjoyed going to Hardy’s Well as there was such a buzz around the place. See now I thought it was 1994. So it was definitely 1995. Spring. Hardys well was previously birch villa which was a proper family pub.I like the poem on the wall but that is the only thing I like about the pub as it is now.birch villa should have remained what it was . A family pub run by various landlords.people don’t realise how valuable it was and how the community valued it. When I worked there we had parties for children parties for pensioners.everybody worked together to make a good pub.as for violence very little bit surely other pubs had bits of it too.hope this famous landmark is allowed to stay. Hi Dermot, yes I remember those nights thy Andy put on and the great staff in the pub. I love that poem up on that wall…..it reminds me of happy days as a student living in south manchester for the first time. I remember Lemn Sissay coming to the Poly – to give us all a talk on the Youth Work Course where Tony Atta was our tutor, and giving him a lift in my little mini down Oxford Road with Parvinder, and Rachel. The poem should be preserved as part of Manchester’s Art and culture….Happy days. Thanks karen I remember those days too. Really sad, it was a great pub but the last owners ran it into the ground. We’d love a poem on our building at the other end of curry mile, about to email Nicky! I’ll chain myself to this place in front of the bulldozer! There must be someone with a few quid who can bring her back to life? by the bar, buy a bitter: bother begone! Bellow, brag, bargain, bolster, breeze, bump, then bail. Beer buoys, but beware: abuse befuddles. of the boys, the birds and the bees. This is terrible news! I am very sorry to hear it. I am a big fan of your landmarks. I wrote about this particular poem in my book Postcolonial Manchester (MUP, 2013). I had an amazing time photographing these early landmarks by you and another sequence by Suandi (the discs along Salford Quays). The Hardy’s Well poem is a really special landmark. There’s a fascinating essay by Deirdre Osborne (in a book edited by Cornelia Grabner at Lancaster) which praises your work – I think that essay concentrates on a later London landmark but I think it’s important to remember Manchester’s pioneering poems. It started up North first I think. The earliest example of landmark poetry in the North West seems to have been organised and curated by Graham Mort. He got pupils to write poems (in Urdu and English) and these were turned into inscriptions in the 1980s. I’ve just read with interest this story about the MMU-owned Salutation Pub off Grosvenor Park in Chorlton-on-Medlock: http://www.mmu.ac.uk/news/news-items/2733/. How about UoM stepping into the breach and doing the same for Hardy’s Well? I see the Salutation also provides meeting space for use by the local community – we’re desperate for such facilities in Rusholme in the evening when our community centres are shut. Imagine it! A spokesman from UoM copying the MMU spokesman and saying, in a year or so’s time, “This is a landmark pub with a lot of history and we believe it is an important asset to our campus and the wider community.”. So sad – and cross – to see this: https://rfcivicsociety.files.wordpress.com/2015/09/20161206_1325531.jpg. Oh man!! First the pub runs down and now this. Just been past Hardys – it’s still there, though looking forlorn. Graffiti (not to the standard of Banksy). Seeing your work got me tearful, thinking of the pre-internet days, loves lost an found, friends who have now left us. Cats (I thought of them all, I had many over the years!). And MUSIC! Man, my lifeblood. I remember your tv prog (Cellar Jazz? ), twas good stuff.